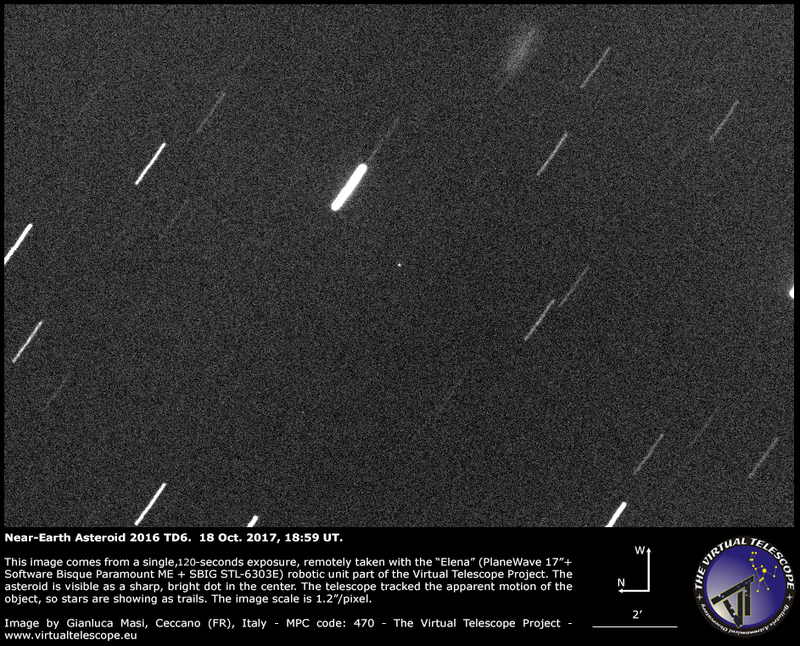 The near-Earth asteroid 2017 TD6 was discovered by the Pan-STARRS survey in Hawaii, USA, on 11 Oct. 2017. On 19 Oct. 2017, it will have a very close, but safe encounter with the Earth (about 192.000 km, 0.5 times the mean distance of the Moon). We managed to capture an image. At Virtual Telescope Project we could capture 2017 TD6 while it was safely approaching us. The image above comes from a single, 120-seconds exposure, remotely taken with “Elena” (PlaneWave 17″+Paramount ME+SBIG STL-6303E) robotic unit available at Virtual Telescope. The telescope tracked the fast (37 arc-seconds per minute) apparent motion of the object, so stars are trailing, while the asteroid looks like a faint dot of light in the center. The size of this objects is in the range of 9.9-22 meters and on 19 Oct. 2017, at 18:53 UT, it will reach a minimum distance from the Earth of 192.000 km, with speed relative to Earth of 9.21 km/s.